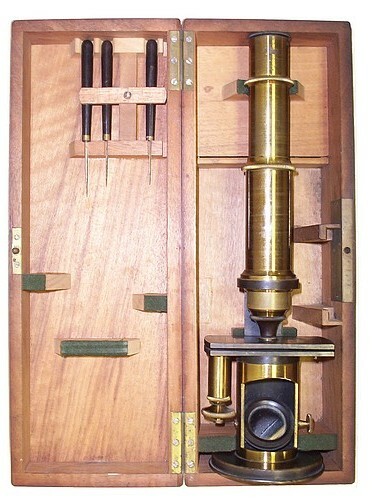 This type of drum microscope is similar to those that were produced by Oberhäuser and later by Hartnack. It is constructed of lacquered and oxidized brass. The coarse focus is accomplished by sliding the main tube up or down. The fine focus mechanism moves the upper stage plate and is located at the side under the stage. There is an aperture wheel to control the light reflected by the concave mirror that is adjusted from the back of the lower drum. The microscope is supplied with a single triple button objective, one eyepiece, and a selection of dissecting tools. This corresponds to the first item in the price list included in the illustration below.